For the past decade Ulrich Krauss has curated projects that aim to bring fine and culinary art together. For this project he is installing, interpreting and cooking The Endangered Species Recipe Book, a work by myself and Hugo Bastidas over the course of this summer. The work opened as part of Berlin’s Food Art Week http://www.foodartweek.com/food-art-week. This project is taxonomy, menu, performance and exhibition is dedicated to the naturalist E.O. Wilson who believes that by the end of this century—in our lifetimes, we will lose half of all plants, animals and birds on our planet, if our current rate of ecological destruction continues. The Endangered Species Recipe Book isn’t actually a book. It is a series of oil paintings on paper. Each painting depicts an extinct or endangered animal, along the earliest known recipe that us humans may have used to cook the unfortunate creature. For this exhibition we have enlarged the Recipe Book works on paper by four German animals that are accompanied by their historic recipes from this region. 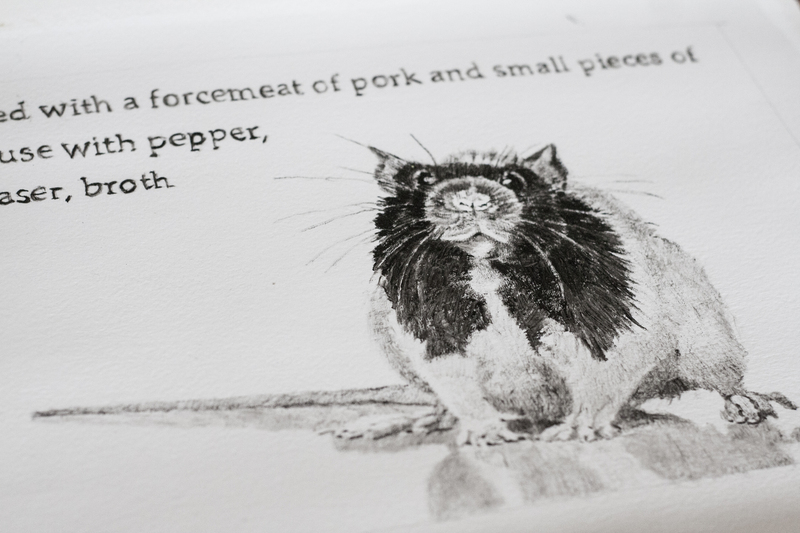 We created new recipe pages for the aurochs, the hooting, the wild boar and the dormouse. Ulrich Krauss here serving the Endangered Species Recipe project at the opening on June19th, 2015. 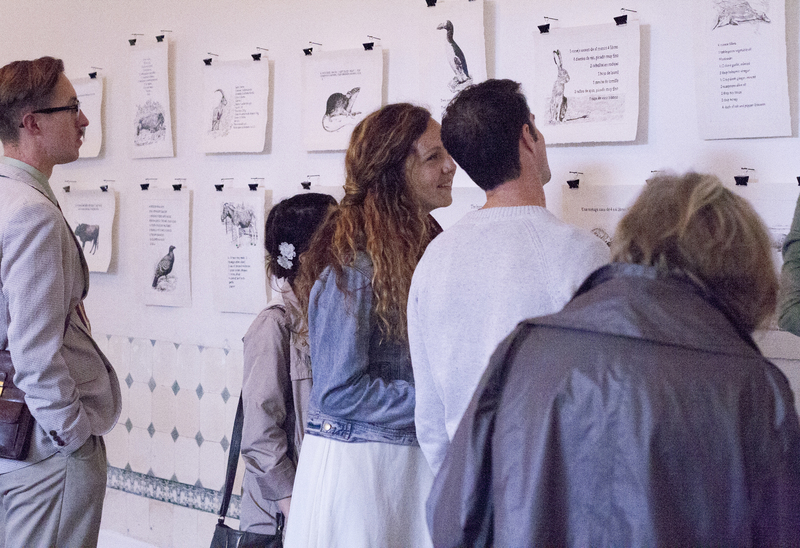 Visitors at Zagreus Project during the opening of The Endangered Species Recipe Series. For the wild boar we went with a recipe for a pig sausage with liver. That was actually used in Accumulation, Ulrich’s first course of the formal dinner. In German: Leber Würste, Man muss die Leber, ehe sie gekocht, fein hacken, und alle Adern hears machen, darzu thun Pfeffer, Nägelchen, etwas gestossen Salz, in Milch geweichtes Weisbrodt, feine geschnittene Stücken Fett von den Flaumen, und es in die Därme thun, aber nur halb voll, und sie gahr kochen. In English: Liver sausages, The liver has to be chopped finely before cooking, add pepper, gloves, some salt, in milk, soaked white bread and finely chopped pork belly fat, fill it in the guts, but only half and cook them. Ulrich creating the menu and food for the project. The animals featured are lamb, beef and dear, all from a local farmer. For the aurochs and the dormouse we went with Roman recipes. The aurochs is now pictured with an old Roman recipe for gelatin. Originally a savory dish, gelatin was used to preserve food such as fish. Varients of this can still be seen in recipes for things like gefilta fish. The recipe goes: 2 1/4 pound beef shin with bone (have the butcher crack it), 1 pig’s foot, cut in small chunks, 1 veal knuckle, 1 onion stuck with 2 cloves, 2 carrots, 1 bay leaf, 1 teaspoon thyme, 1 stalk celery, 1 clove garlic, 1 tablespoon salt, 1 cup sherry or Madeira, 2 egg whites, lightly beaten (if necessary) Place all ingredients except the egg whites in a pan. Cover and cook over medium heat for about 4 minutes. Add 3 pints water. Bring to the boiling point, cover and simmer for about 3 1/2 to 4 hours at the lowest possible heat. The liquid should just ripple. Pour the stock into a bowl and cool. Chill overnight. Skim off all fat. If the jelly is not clear, bring it to a boil again and add the egg whites. Boil gently for 10 minutes and strain clarified liquid through a cloth. The dormouse was also cooked in interesting ways. The Romans ate the animal as a snack, roared on a stick and covered with honey and seeds. For the Endangered series we went with the recipe for “Stuffed Doemouse” pictured above. 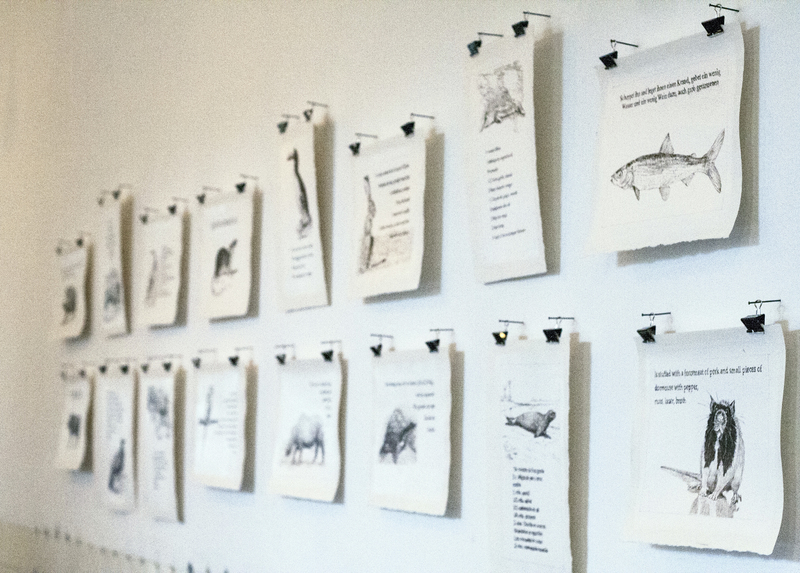 For the opening of the exhibition Ulrich and the staff at Zagreus created a series of appetizers that mirror the Endangered Species Recipe dinners. 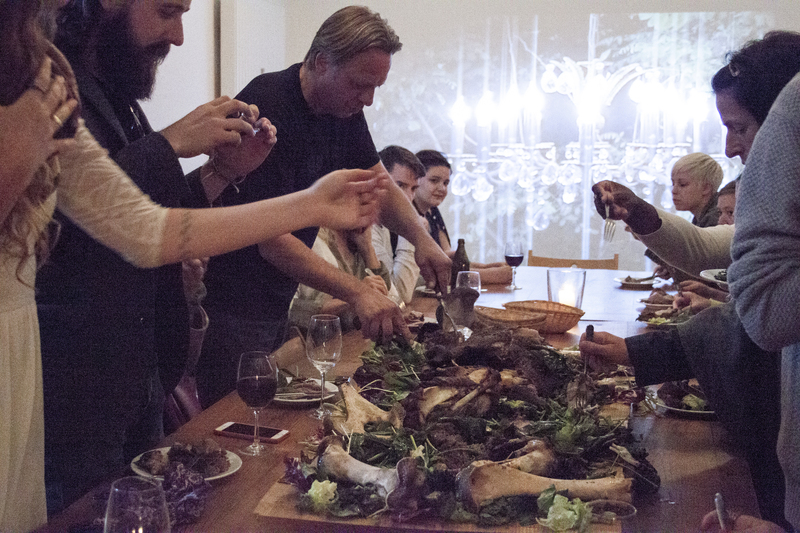 For the opening of the exhibition Ulrich and the staff at Zagreus created a series of appetizers that mirror the Endangered Species Recipe Dinners that will follow and be served at Zagreus Projekt over the course of the next two months. 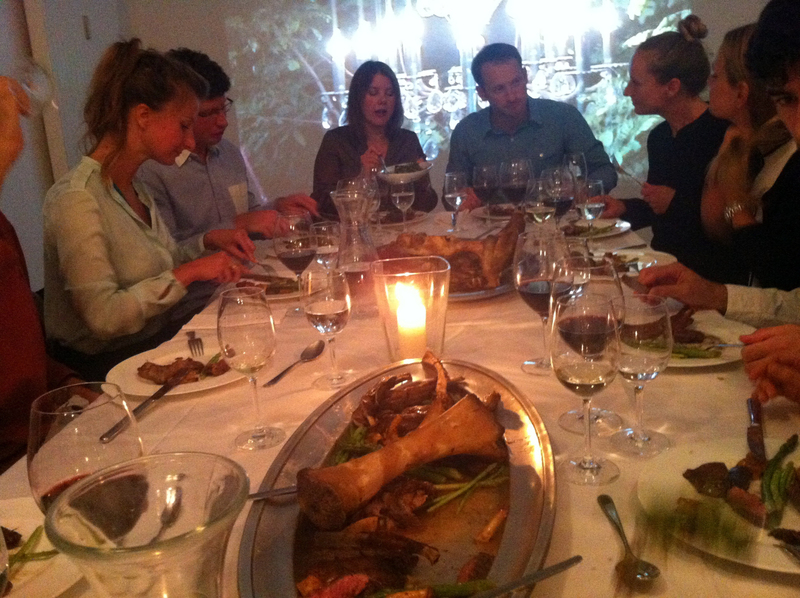 Shown here is a version of the Memento Mori which is the second course of the Endangered Species dinner. In this case, meat cooked on the bone. The animals featured are lamb, beef and dear, all from a local farmer. We will be showing the Recipe Book, along with a site-specific (and species specific) installation of the Songs We Sing Berlin. In this work I will ask Berliners and fans of the Recipe Book series, to record the sounds of themselves attempting to make the calls of Berlin birds. I will then sample these calls and randomly play them in the courtyard at Zagreus for the duration of the exhibition. Through out the course of the exhibition, Zagreus will be serving the Endangered Species Recipe Dinner twice a week. I will be posting the menu in the next couple of days. A the video of the first Endangered Species Dinner is here: https://vimeo.com/133577367. 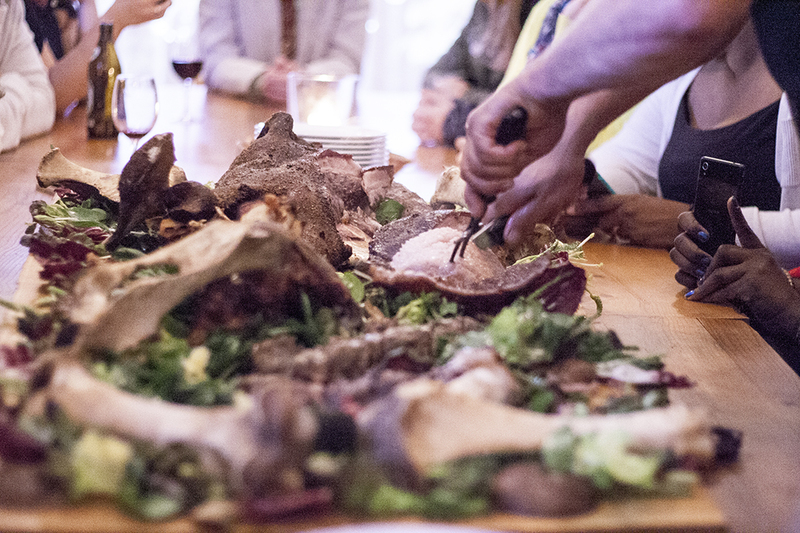 The first Endangered Species Recipe Book Dinner, June 20th, 2015. A the video of the first Endangered Species Dinner is here: https://vimeo.com/133577367.